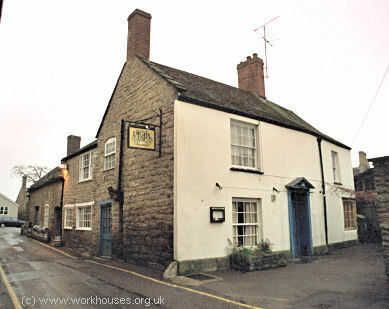 The Abbey Priory in Sherborne served as workhouse between 1737 and 1749. Town maps of 1735 and 1814 show "The Parish Poor House" on the site new occupied by the Digby Tap public house. Sherborne former parish workhouse, 2004. Dorset: Beer Hackett, Bradford Abbas, Castletown, Caundle Bishop [Bishop's Caundle], Caundle Marsh, Caundle Purse [Purse Caundle], Chetnole, Clifton Mabank, Folke, Haydon, Holnest, Leigh, Lillington, Longburton, Nether Compton, Over Compton, Oborne, Ryme Instrinseca, Sherborne (5), Stockwood, Thornford, North Wootton, Yetminster. Somerset: Goathill, Holwell, Marston Magna, Pointington, Rimpton, Sandford Orcas, Trent. The population falling within the Union at the 1831 census had been 11,243 — its parishes ranging in size from Goathill (population 35) to Sherborne itself (4,075). The average annual poor-rate expenditure for the period 1833-35 had been £5,261 or 9s.4d. per head of the population. In 1836, the Poor Law Commissioners authorised the Union to spend up to £5,000 on the building which was to accommodate 240 inmates. Work began on the building the following year, on a site at the corner of Horsecastles and Lower Acreman Street to the west of the town. This site was chosen by the Guardians as being "open to the Sun and Air, well supplied with water, and in every other respect conveniently situated". The building was designed by Edward Percy and from map evidence appears to have been loosely based on the popular "square" plan published by the Poor Law commissioners in 1835. The entrance block on Horsecastles had an imposing three-storey frontage. The Sherborne union workhouse buildings were demolished in 1938. Dorset History Centre, Bridport Road, Dorchester DT1 1RP. Relatively few records survive. Holdings include: Guardians' minute books (1836-1930); Ledgers (1911-27); Workhouse inmates' property register (1920-31); etc. Dorset Workhouses Countryside Treasures Survey (Dorset County Council, 1979).